Data Matrix is ​​a two-dimensional matrix barcode consisting of black and white “cells” or modules arranged in either a square or rectangular pattern. The encoded information can be text or raw data. The size of the data is from a few bytes up to 2 kilobytes, the length depends on the information to be encoded. It is possible to insert error correction codes to increase the symbol strength: symbols can still be read even in case of partial damage. Ascii: enables encoding of all of the 256 characters of the standard ASCII table. Produces the best results on numeric characters and ASCII values between 0 and 127. C40: enables encoding of numbers, letters, and a few special characters. Best for alphanumeric codes with mostly upper case text. Text: enables encoding of numbers, letters, and a few special characters. Best for alphanumeric codes with mostly lower case text. X12: enables encoding of the characters included in the ANSI X12 set. Edifact: enables encoding of ASCII characters ranging between 32 and 94. Included for backward compatibility, it is considered obsolete. Base 256: specific encoding for byte data ranging between 0 and 255. By using this encoding algorithm it is possible to encode any value between 0x00 and 0xFF (decimal 0 ~ 255). In order to use this encoding you need to enter a string containing 2-digit hexadecimal values separated by a space: I.e. : 32 FA 56 E8 12 … etc. The Symbol size combo box enables you to enter the minimum symbol dimension. The Data Matrix architecture organizes data in a series of square or rectangular matrices, combined to represent the encoded data. The number of required matrices depends on the amount of data encoded. Normally, the symbol is generated with the least possible number of matrices needed to represent the encoded data. In some cases, however, it may be desirable to increase the minimum number of matrices drawn to ensure that all printed symbols are the same size, regardless of the amount of encoded data. 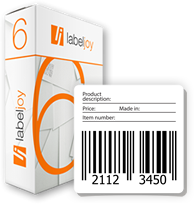 For example, if you connect a Data Matrix barcode to the address field of a data source, all the icons, regardless of the length of each address, may need to have the same size. 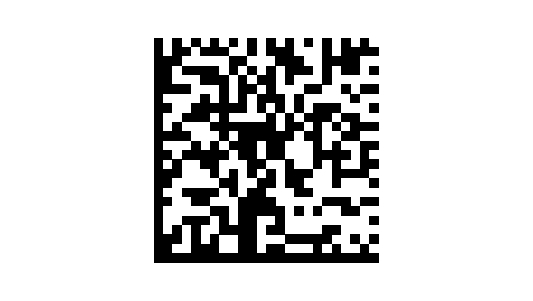 In such a scenario, you can define a minimum icon size for all generated barcodes. Text contents must comply with the selected encoding algorithm. Text length must not exceed maximum capacity. Data Matrix symbols generated with Labeljoy do not support: Extended Channel Interpretation (ECI), FNC1 mode and Structure Append mode.